5 weeks and 0 days post surgery. So its been a total of 6 weeks now since my injury. Things have been broadly improving. The physiotherapy and the stretches have been very challenging. It seems that some days I spend my entire day doing physiotherapy. I tend to start the day with a large smoothie and then bath physiotherapy in order to “get the arm going”. I find that over night, because I’m not exactly moving around much, the arm “sets” in position. This is an irritation as much as anything, as you try and get up without putting any stress on the arm. That might not sound like a major issue, but when its your dominant arm, and you can’t really put any pressure through it, just getting up as a bit of an issue. 3o seconds of trying to extend, or press down with my elbow flexed. Given there is a considerable degree of physical effort, and a fair amount of discomfort, that’s meaning 30-40 mins in the bath at a time. 3-4 times day. It took me a couple of days of doing this to realise I need to have electrolyte drinks with me in the bath just to replenish the sweat. HOWEVER as time consuming as this may be. I’m seeing VAST improvements in the arm every few days. Extension, the ability to straighten the arm is still relatively poor. However flexion is coming on brilliantly. Part of this improving I think is also due to the slowly reducing swelling in the arm, but its all good. The other main activity I try to complete on most days is walking at least 10,000 steps, which I’m monitoring with the Garmin 920XT. One of the earliest pieces of advise I was given by my consultant was to walk with the arm hanging by my side, to allow gravity to help stretch things out as well. That was built upon by the physiotherapist advising me to exaggerate may arm swing when walking, to try to further extend the arm. Initially uncomfortable at the start of a walk, but definitely showing a clear benefit at the end of a walk. 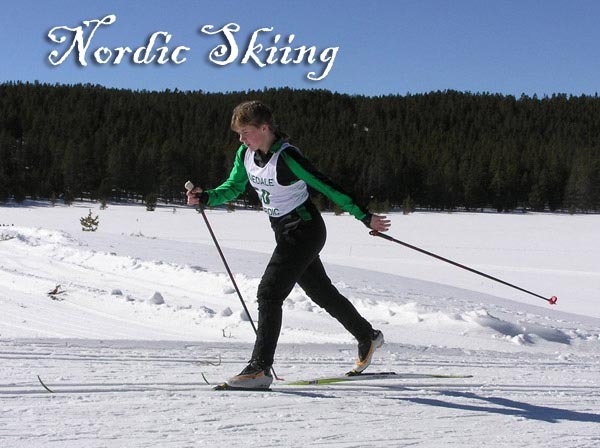 As odd as it might be, I have found when the arm gets really stiff, walking, and moving both arms as if I were Nordic Skiing is very effective. Fully extending and flexing the arms. But I look very daft, so I tend to limit that to the country lanes! Nordic Skiing – Like me, but with less snow, and walking poles. Also no Skii!!! One of the activities I had been holding off starting was swimming. The benefit of swimming is that it supports the arm, and crucially the elbow, whilst you are going through the extension movements. Frankly I hadn’t wanted to start until I felt I had an acceptable range of movement. Plus a handle on my discomfort. The whole week I had minimal pain, and a good range of movement. 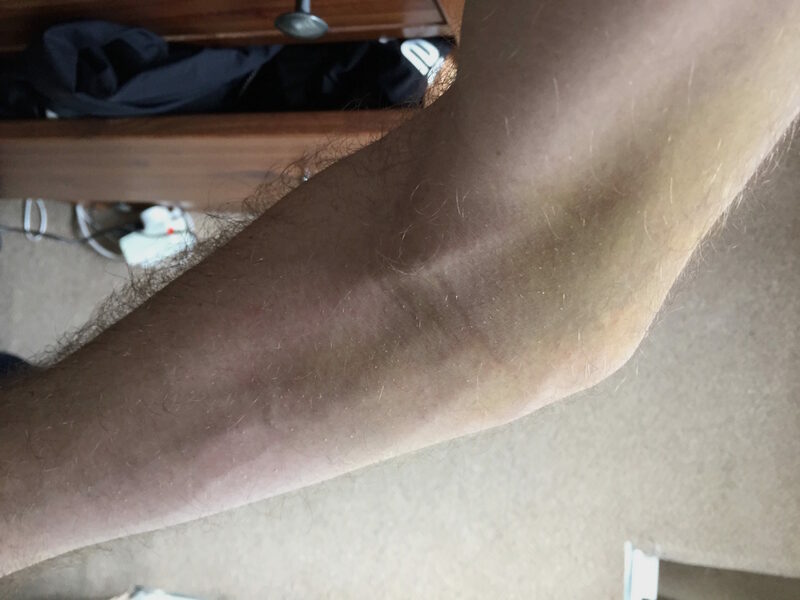 The physiotherapy sessions were really pushing the elbow, trying to get that last 10degrees when flexing/bending the elbow and improving on the 20 degree still needed to straighten in the arm. I was feeling very positive. So I decided that given I was 5 weeks post op, I’d head to the pool. Which if I’m honest I didnt think was that helpful. A bizarre exercise I have found helps is unloading the dishwasher with the RIGHT affected arm. Stretching and extending the arm out gives me a good idea of my strength and range of movement. Suffice to say I didnt want to try to drive yet! However that did mean a slight walk to get to the pool. A walk of about 45mins. However it was a lovely day! 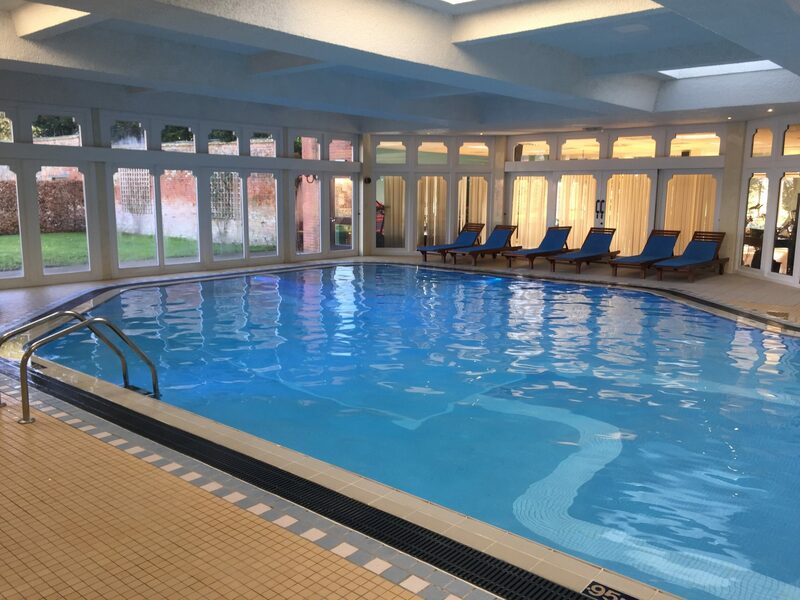 The pool I walked to was at Walton Hall. A beautiful old stately home in the next village. 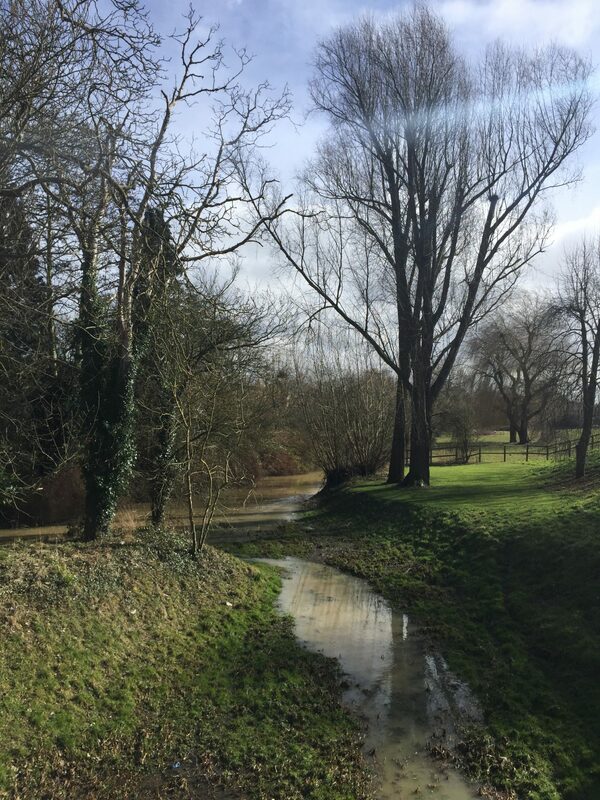 It lovely walk down, but also has a great road running through the estate that I use for a 10km running route. If I have decided to train for another ToughMudder event, there is even a watersplash if I’m feeling adventurous! The pool there is *quite* small. Not deeper than my chest at any point. Not somewhere you’d go to do swimming training. But the depth and the easy access to the sauna made it perfect for rehabilitation work. The first pool session was hard work, but went well. I managed 3×10 minute blocks. Just walking backwards and forwards in the deep part of the pool, doing the breaststroke arms. Each 10minute block was then broken by a 5-8 minute session in the sauna. Well basically as long as I could stand, stretch out the arm, before returning to the pool. All in all, the first swim physiotherapy session went well. Confirmed by the easy of moving the arm on the 45min walk home. Unfortunately the next day, things didnt go to plan. I managed 1x10min block, with a lot of discomfort at the end, and then a 4 minute block before having to stop. Now this is not to say the elbow was painful, but certainly a lot of discomfort even at rest, and really quite a bit at the extremes of movment. So I stopped and went home. The problem was the discomfort didnt improve for the rest of the day. The new discomfort produced a troublesome negative feedback cycle: As the arm was painful, I didnt push as far with the physiotherapy, even in the bath. Meaning a slight reduction in range of movement. Then waking the following morning, quite a bit more stiffness. One thing I do wonder is if I’ve been trying to do too much? I was pretty sure when I decided to go to the pool I was 5 weeks out of plaster. Turns out I wasn’t even even 5 weeks post op!! In fact the accident only happened 5 weeks ago on the day I went swimming, so only 3 out of plaster! It was amazing how time had seemed to warp being off work. So here the stupid doctor brain starts up again. One of the big problems at this stage of a fracture healing, whilst not exactly common, is non-union. Where the fracture doesn’t join properly. My worry is that given the continued discomfort at several days now, I’d disturbed the fracture site. 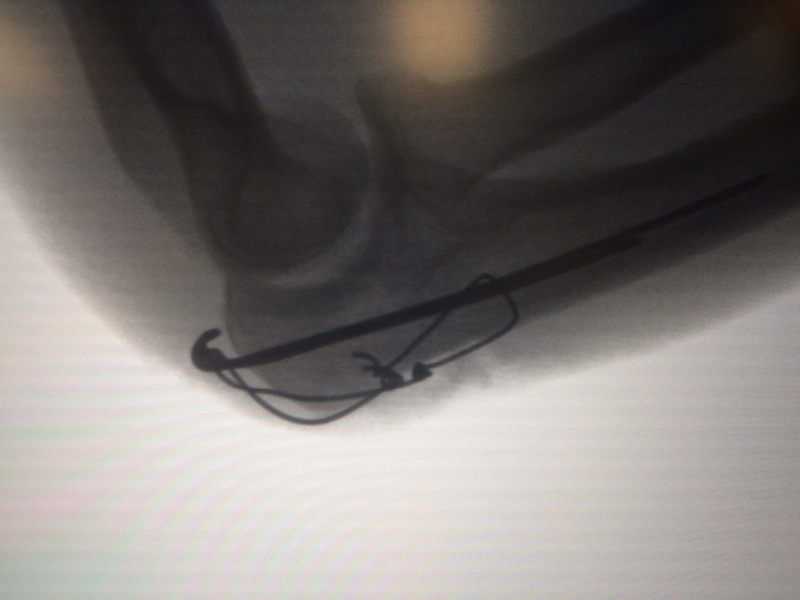 However disturbing the fracture site shouldn’t be very easy to do, given the metalwork in my arm. Plus doing pool exercises should be relatively safe, a the water supports the arm, and you are not exactly putting a lot of force/weight through the joint. 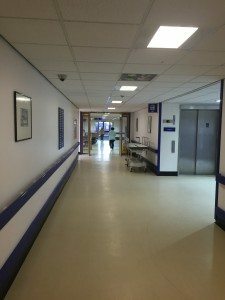 Thankfully on the two days after the pool physiotherapy, I had another land based physiotherapy appointment. Even in spite of the discomfort, it turns out that I was doing something right. At the start of the session I could extend to 24degrees off fully flexion. A little disappointing, as previously I’d been able to get down to only 21degress off full flexion. However after a rather uncomfortable deep tissue massage. Directly over a large bruise I hasten to add. Still after the massage I was really glad to see I had improved massively to only 10 degrees off full extension! Something was obviously working somewhere. I still wanted to start running again, but was told to wait another weak, as the disadvantage to early running was a of a lot of vibration at the joint line. I was told that continuing on the turbo trainer would be good though. Allowing me to try and stretch, whilst watching my movements and trying to support the arm. However I’ve not enough strength yet to be able to hold the handle bars comfortably in a normal position yet. But its coming. 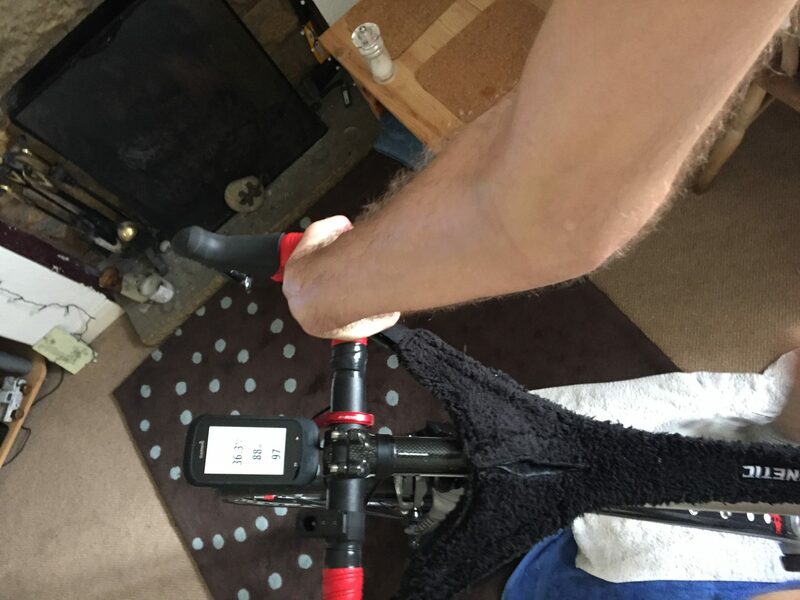 At the moment when using the turbo, I sat upright. 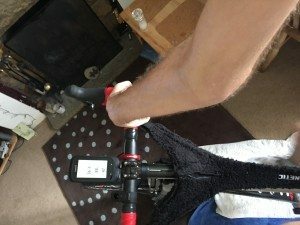 This allows me to continue doing upper body stretches, whilst not actually using the my arm against the handlebars to ride. Then intermittently stretching against the handlebars. Plus I think it’s quite an effective exercise to promote my core stability! Although continued use of the turbo was encouraged by the physiotherapist. Given the problem with the pool. It was advised that I don’t do anything other than stretching, walking and static biking for the next week. At that point we can re-review and see how things are looking with pain, and the strength in the arm.